Adel Iowa 2012 – Memorial Day – FREE DVD Giveaway! We are taking advantage of the opportunity while camping. So many people come in and out of these campgrounds we are staying at. Especially during Memorial Day weekend! YAHWUAH gave us the wonderful idea to put our sign outside and advertise our free DVDs. The city campground in Adel, Iowa, (Island Park) was full during memorial day weekend with tent after tent lined with RVs and Motor homes. Sorry we didn’t get a picture of the campground sign, but the sign by the road said “FULL tents only”. While camping at the Adel Island Park, we became good friends with a few of the city workers. We had a wonderful time sharing the Besorah of Yahushua with them. They even took some of our free DVDs. 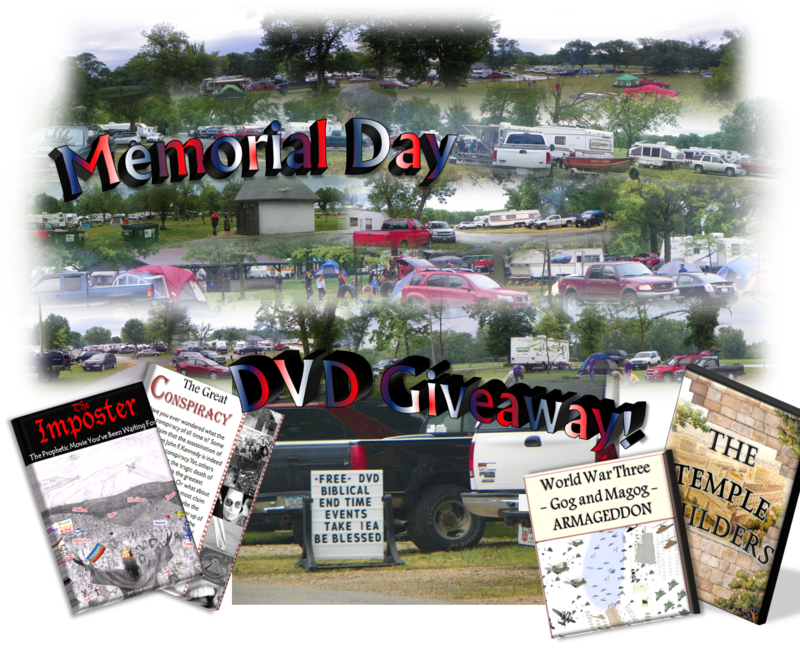 During our stay in Adel Island Park, we gave away close to 50 DVDs, HalleluYAH! We will use any means necessary to get this message out there! If you are ever around, out and about, and happen to spot our sign, don’t be shy, come say ‘hello’ and take your free DVDs! If you don’t see us and still want our free DVDs you can download them or request your free copys in the mail today! Despite the rough roads it has overall been a great tour so far. Meeting new people from all different ethnic groups. The people that come into these campgrounds we stay at are from all over! Staying at active crowded campgrounds is really beneficial in this tour. It is so rewarding when we get to see someone pull up or walk up to the front of our RV site and ask, “These are free?” With our response of “Yes! Please take one of each!” they eagerly reach into the tote full of DVDs, thanking us and leave. Our white truck on the left, next to the *FREE DVD* sign. We actually had a tote full of DVDs sitting near the sign, but it was late and rainy. We have met and came across so many different kinds of people. Rich and poor, small and large. One large family we met gave us the idea to have a big chili dinner! And so we did! We threw together red beans, chili beans, kidney beans, tomato sauce, chili powder, cayenne powder, ground beef with onions, diced tomatoes and cooked elbow macaroni. Sister Felicia baked 50 cupcakes. Sister Linda and Felicia iced/decorated them together. We shared the BIG chili dinner with several in the campground for dinner that night. Everyone greatly enjoyed it! It was a wonderful blessing for us to be able to share the abundant food Yahuwah has blessed us with. So many go without. One family we shared this dinner with (a widow with her two sons and daughter) only had chips and pop in their damp tent to eat. These people were homeless, living in their tent and they were still there when we left. They were so happy for the hot chili, crackers & cupcakes on that cold rainy day. HalleluYAH! They were not the only ones homeless. Many people live in tents at campgrounds, we are seeing more and more of this. We share our experiences with you not to brag or boast, but to give you ideas of what us Temple Builders should be doing. If we can do this, you can to! Why not gather your spouse, your children, and go on a camping trip for the weekend? You can set up a sign, bring some witnessing materials, bring extra food and witness to those who would not normally hear the Besorah of Yahushua. NOW is the time to PROCLAIM, to WARN and to BUILD!